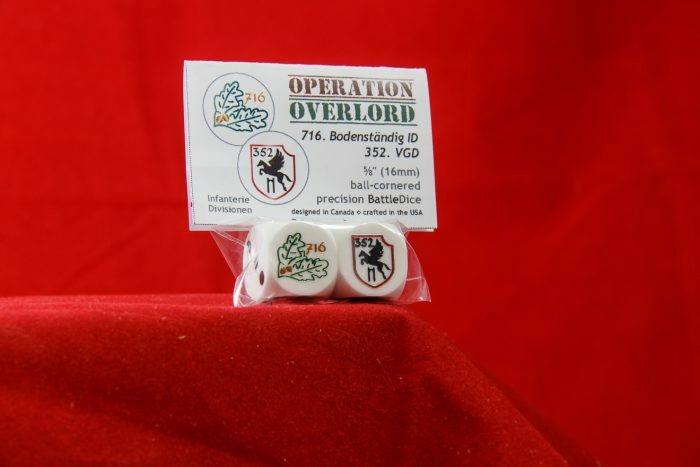 In 2016, Battleschool debuted a new collection of themed precision dice for ASL players, a collection in the same vein as its earlier Stalingrad collection. One presumes that these collections presage a never-ending series of World War II unit-themed dice from Battleschool, with the only connection to ASL being the Rate of Fire emblems on the colored dice in the series. One hopes that this will not be the case, that Battleschool will try to make its future dice releases more directly relevant to ASL itself. 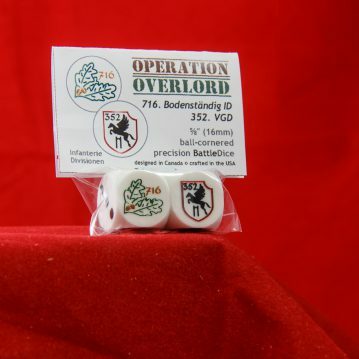 Certainly, the Operation Overlord collection, of which the two dice here are one of its six sets, has virtually no connection to ASL. It is not tied to any particular ASL product, and, though there is an ASL product for one of the six sets (not this one), that seems to be entirely coincidental. Certainly there is no connection with this set, as ASL designers have not exactly given love and attention to either the German 716th Infantry Division or the German 352 Infantry Division (oddly referred to here as the 352nd Volksgrenadier Division, though that was the name given to the reconstituted version of the unit recreated later in 1944 following its destruction in Normandy). And, since these dice are white, not colored, there are not even Rate of Fire emblems on the dice. 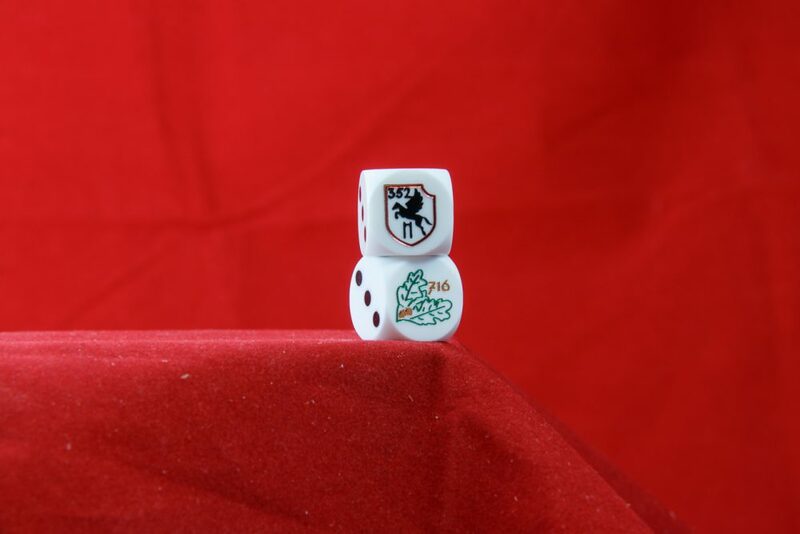 The two dice are 5/8″ (16mm) ball-cornered precision dice, each white with black pips. 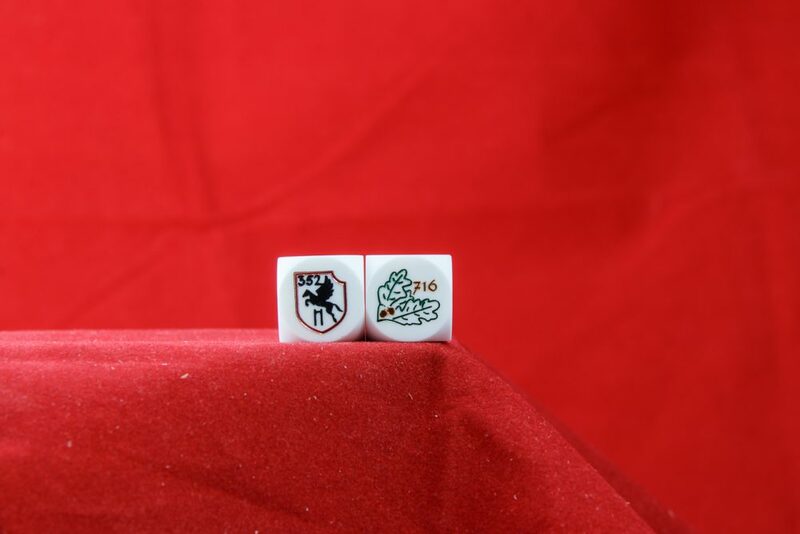 In lieu of the 1-facing, each die has a divisional insignia, one for the 716th and one for the 352nd. The 716th’s image appears to be a set of oak leaves, done in green foil; the 352nd’s insignia is a Pegasus silhouette on a shield; the shield outline appears in red foil. Both dice are attractive.